June | 2014 | The Captain Britain fans' page and blog. Captain Britain meets Bruce Forsyth and Judge Dredd. Was Alan Moore responsible? 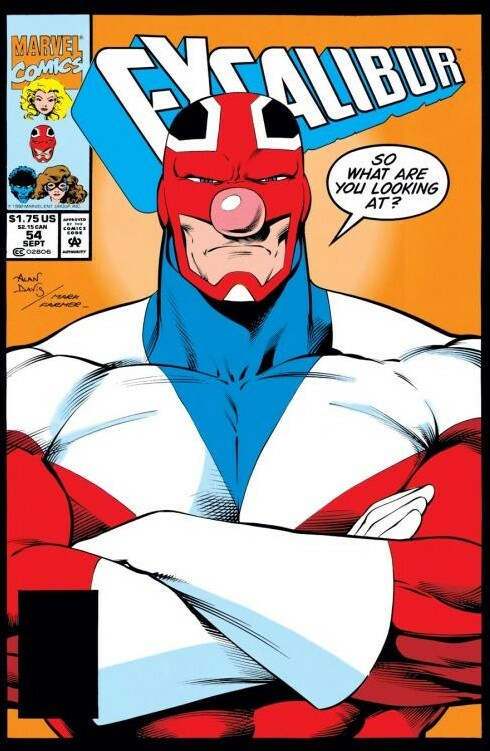 In 1991, comic publishers Fleetway licensed Captain Britain, along with other UK comic book characters to appear in their one-off Comic Relief charity comic. For the good Captain his appearance here rates perhaps as his most surreal cross-over ever. Read on to find out why. 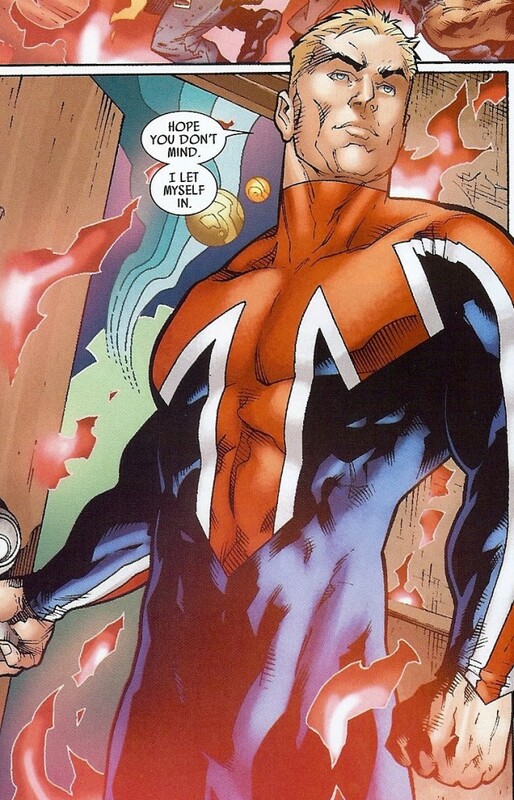 Captain Britain’s appearance is reprinted below – click to enlarge. So, Captain Britain faces off against some distinguished competition in what can only be described as a ” chin off.” From left to right his rivals are…. 2000AD’s legendary lawman, Judge Dredd. From The Eagle, hard travelling space hero, Dan Dare. From the now sadly cancelled kids comic The Dandy, Desperate Dan. Last but by no means least comic book collector and writer, Jonathan Ross. Despite the propensity of their chins all the entrants have no chance against UK entertainer Bruce Forsyth, but to be fair he really does have a big chin, there is little exaggeration in the comic book panel he appears in. Despite a lot of searching I’m still not sure who wrote Captain Britain’s Comic Relief appearance. However, I would like to imagine with the subversive humour on display and his past history with the character that Alan Moore was to blame. Who knows? As you can see from Cap’s appearance Comic Relief is celebrated with all involved donning a comedy red nose, and his charity appearance wasn’t the last time he wore one. Years later on the cover to Excalibur 54 ( pictured below) Alan Davis was to draw Cap with exactly the same nasal appendage. So there you have one of Captain Britain’s weirdest cross-overs, but as it was all in a good cause, I’m sure you will join me in forgiving Fleetway for this odd Cap appearance. Before I sign off while researching this article I found this interesting snippet from Neil Gaiman on his input to this comic here. 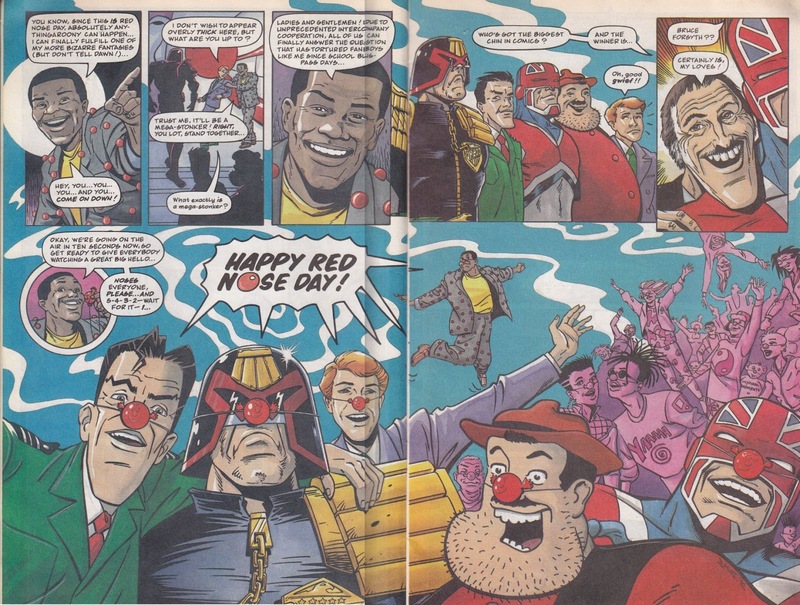 Do you remember the Comic Relief comic? Do you think Captain Britain should have won the ” chin off, ” or are you just left confused? OK, so after a long absence the Captain Britain blog is back in business. All the Cap news, views and obscure trivia you will ever need will be making a return to the internet next week. I’d like to say sorry that the blog went away in the first place, I only meant to take a week off blogging last year to refresh my brain, and nearly 12 months later I finally get back to writing. Anyway I’m not going to dwell on the blog’s absence, just to say thanks to everyone who contacted me to see if all was well, to suggest post ideas and share the Captain Britain love. The ” relaunch ” will see a couple of changes to the blog…. Firstly, I don’t want to dwell on all that the Captain has suffered at the hands of Marvel Comics, I don’t want to share his ill-treatment – unless it’s funny because it’s done badly – I want to share the Cap love. Next, not all posts will be about the Captain, I have been reading comics for nearly 40 years and plan to trawl my archives to share some great reads that I hope Cap fans will enjoy. Apart from that expect the usual blend of trivia, archive trawling and nonsensical opinions that pour forth from my mind when I write about my favourite super hero and my love of comics.